I recently tried to re-read one of the Chip Hilton books that I loved as a kid. If you’re not familiar with Chip, he’s the main character in a series of sports-themed novels for boys by Claire Bee, a Hall of Fame basketball coach, published in the ’50s and ’60s. Chip, a teenager, excels in all sports and, through his superior morals and work ethic, invariably leads his basketball/football/baseball teams to the championship despite the calamities that always seem to befall someone en route. Either the books haven’t aged well, or I haven’t, because I could barely make it through one chapter. Jaxie Skinner, the protagonist of Joe Samuel Starnes’s new novel Red Dirt, is no Chip Hilton. For one thing, he’s a grownup, professional tennis player looking back at his career that began when he was three years old and his father, having watched a thrilling Borg-McEnroe match on television, was inspired to build a tennis court into the red Georgia clay of the family’s back yard. For another, he makes a long, self-destructive detour from his career, including a very un-Chip-like brush with alcoholism and numerous brief sexual encounters that demonstrate exceedingly poor judgment. On the other hand, like Chip, Jaxie does enjoy a measure of success in his chosen sport, and this very engaging novel chronicles his early triumphs and then follows him on the comeback trail after a devastating injury. 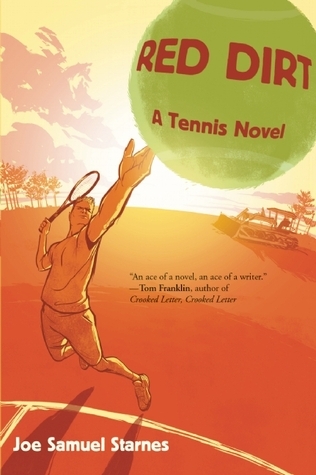 As with other sports novels, it is the athletic competition that creates much of the book’s drama and suspense and keeps the reader turning the page. Can Jaxie beat Andy Roddick in the quarterfinals? Or will his excellent serve fail him at exactly the wrong moment? Will his latest love interest affect his concentration? Has Jaxie learned his lesson about dangerous liaisons? Stay tuned to find out. Red Dirt is published by Breakaway Books (not to be confused with the Break Away Books imprint of Indiana University Press), specializing in “thought-provoking works by, for, and about athletes.” Thought-provoking it certainly is. Jaxie asks himself if the time he has put into tennis has been worth it. He neglected his education and is ill-qualified to do anything but play tennis, and has next to nothing to show for his years of effort. So few players, even really good ones, can make a life as a tour professional. Is it a mistake to even try? Away from the tour, what can they do? Spend their lives teaching the game, like Harry, Jaxie’s has-been coach? Scoring pick-up matches on public courts, like Jaxie’s Number One fan, Fast Eddie? Jaxie is smart enough to know that tennis isn’t everything. It is, however, the main thing that connects him to his father, a relationship that is at the core of the novel. Jaxie’s father, John, not only builds his son a tennis court, he sacrifices everything to support Jaxie’s love of the game, even flying to Paris to join him on a surprising run to the semi-finals of the French Open. And, perhaps more importantly, John instills in his son the values that sustain Jaxie through his ordeals and give him the strength to handle the pressures of the tour. And in that way, maybe Jaxie isn’t so different from Chip Hilton after all. Your thoughtful review has me looking forward to reading Red Dirt. (You hooked me with Chip Hilton.) Thanks for bringing this book to my attention.